March 23, 2018 Spring Break Farm Crew, Ducks, Things Are Blooming!! This week is spring break for the kids in Canon City and it has become a tradition for farm crew kids to come to work for part of a day and help out. Thursday was our spring break farm crew’s day to come and visit and do some work projects here at the farm. 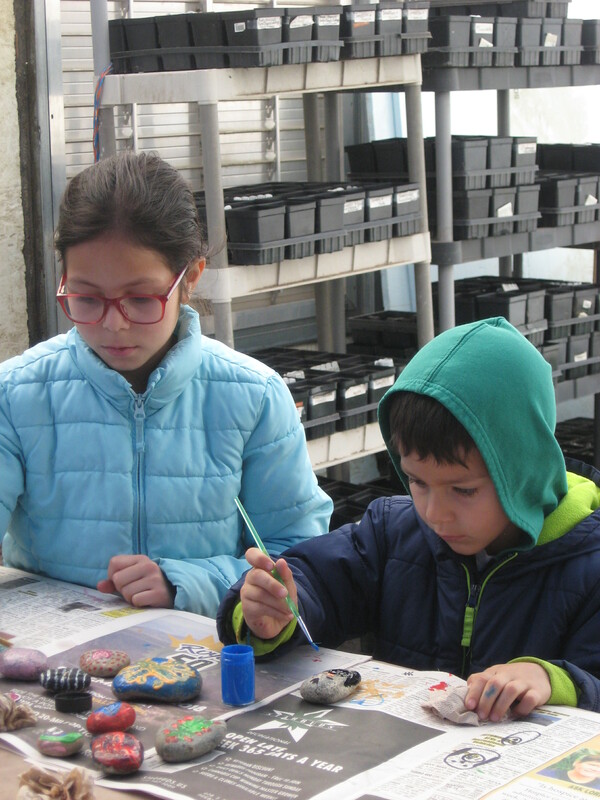 Arianna and Abraham are friends of ours and Shrek’s and they joined us for the rock painting project. Beki’s girls, Keyana and Zia, come to help each year. Painting rocks wasn’t just for the kids. Beki, Lizz, Lesley, Chris and myself all got involved in the project. 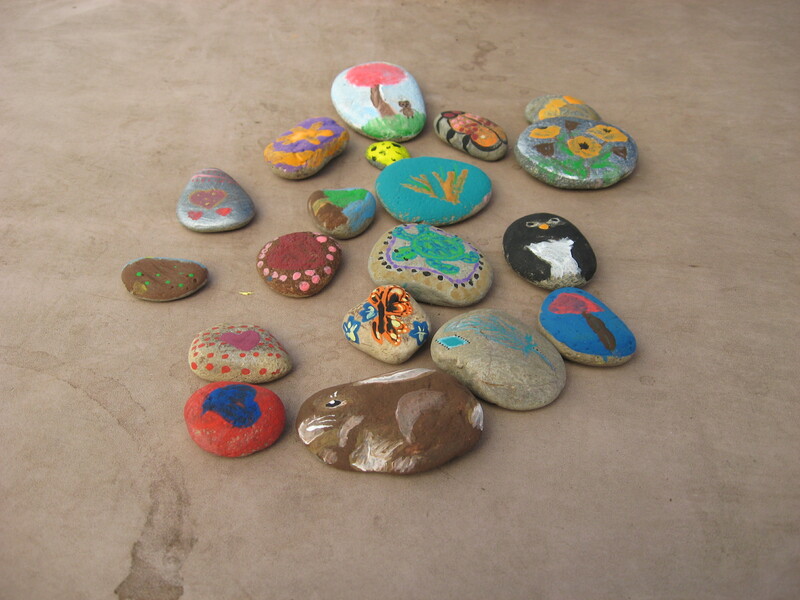 These rocks will be tucked into places around the Farm Stand store and the gardens during Open Farm Days. 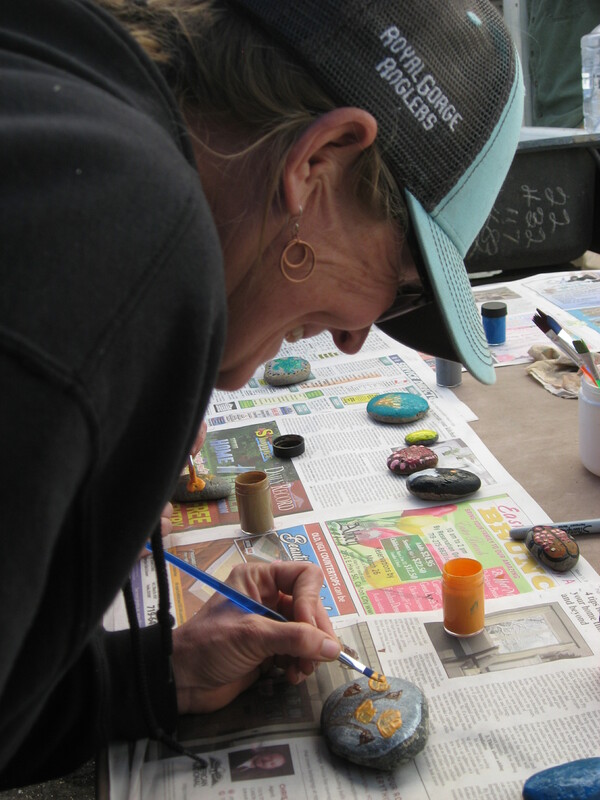 If you visit and you find a painted rock, we ask you to tuck it into a different location in the Farm Stand store or the gardens for another farm visitor to discover. I suppose this could be called a musical painted rock event. 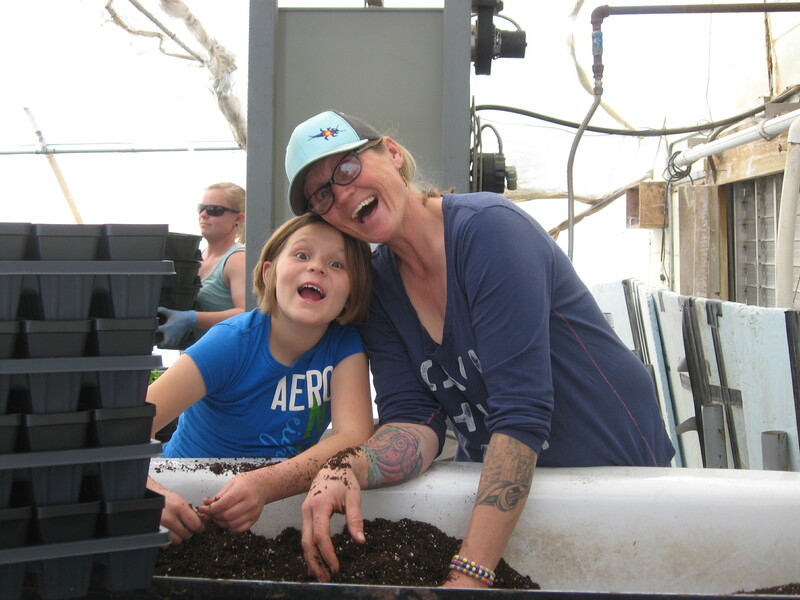 We have friends, Diana and Merrilee, who own Perennial Favorites in Rye Colorado and they have been doing this in their nursery for a while during their Open Days and they made it sound like such fun, I decided we should enjoy it too. By the way, Perennial Favorites will open their nursery doors in May and you should check it out. Their nursery is as fun and beautiful as can be. Of course, we want you to visit our farm and Farm Stand store during Open Farm Days here too, but if you are like we are, there is always time to visit another plant nursery, and you’ll find some fun and beautiful plants at both our Desert Canyon Farm and Perennial Favorites. 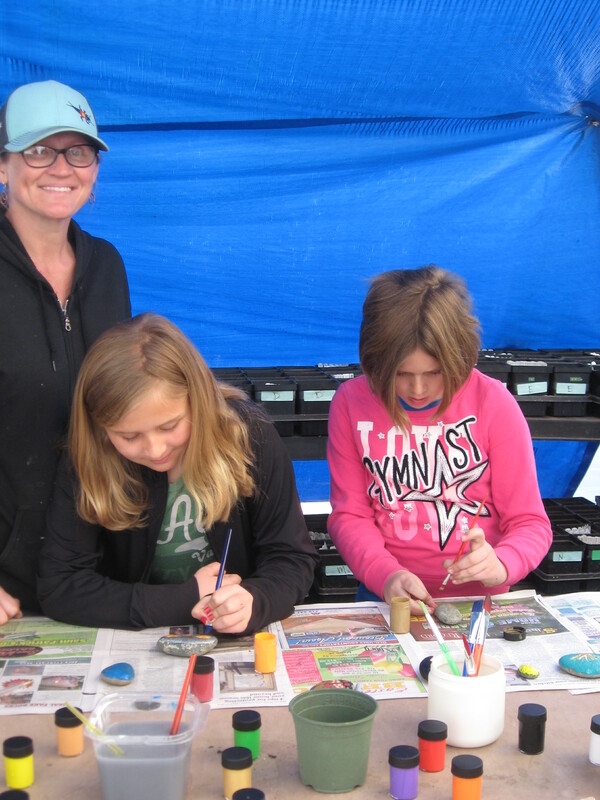 Below are the finished painted rocks that we will be tucking around in the Farm Stand and the Gardens this spring for you to find and re-locate for other visitors to discover! After the rock painting task, it was time to fill F32 flats for planting. The girls were happy to help out with filling flats. Zia was learning how to mix the organic fertilizer and the Rootshield granules into the soil mix. 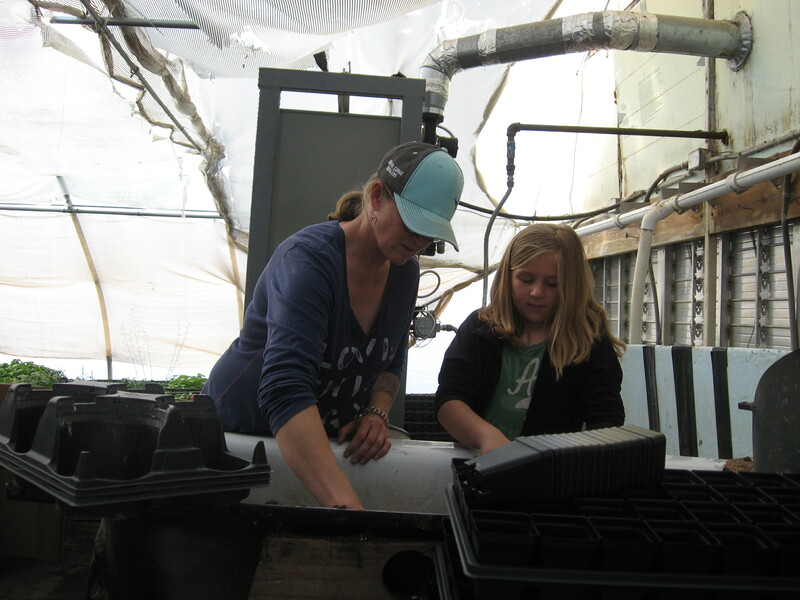 Zia is interested in applying for a farm greenhouse crew position when she turns 14 in a few years. She thinks it would be a great part-time job. 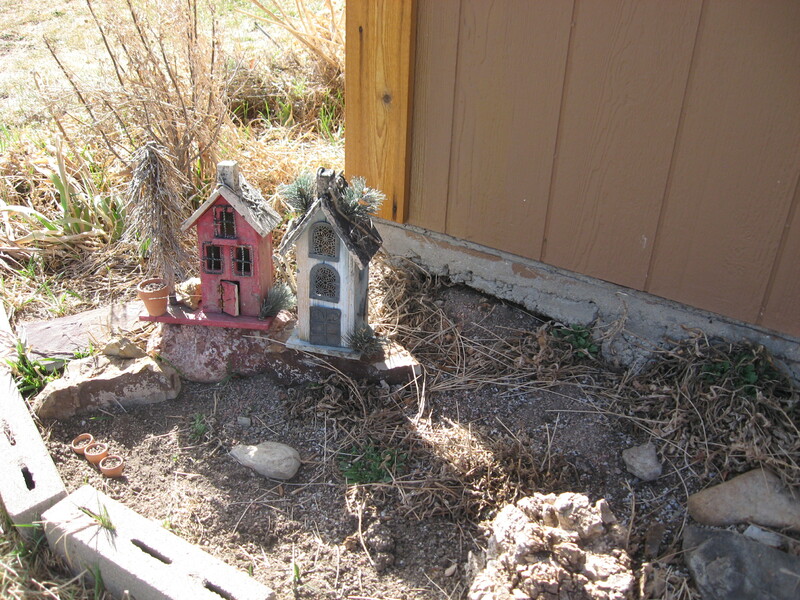 The girls also took time to get the Fairy Garden here at the Farm looking good so that it will be ready to be explored by farm visitors during Open Farm Days, which begin April 14th and go thru June 10th, 2018. We’ll be open every day (except closed on Fridays) during that window of time. Our open hours are 9am to 4pm. I’m noticing so many things beginning to bloom now in the gardens and around the farm. 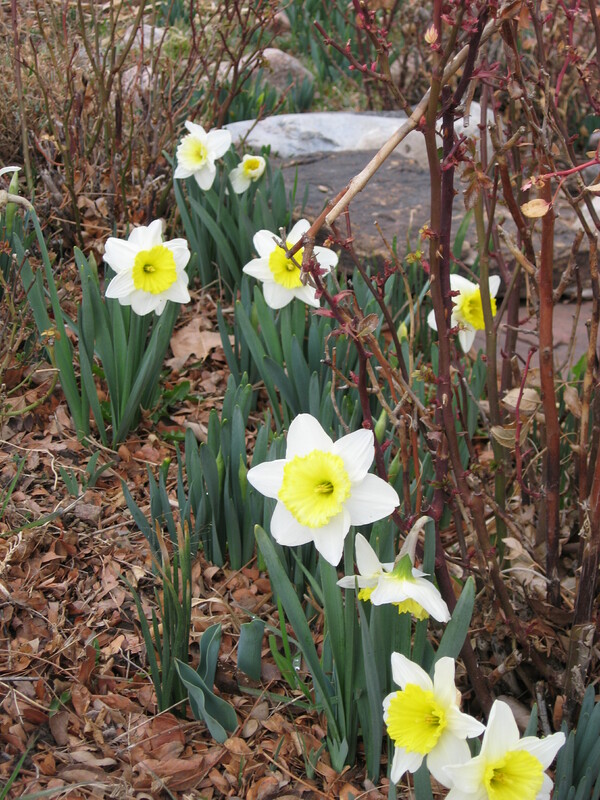 The bulbs are blooming like these cheerful daffodils. Our apricot and almond trees are blooming and the peach and nectarine trees will be blooming soon. 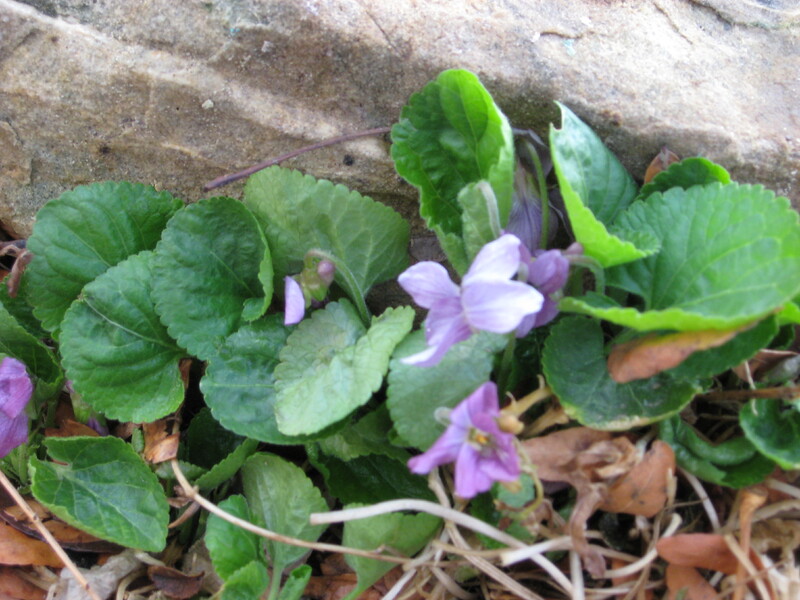 Everywhere you look there are sweet violets and naturalized violas (called Heartsease or Johnny Jump-ups) blooming. These are wonderfully fragrant! 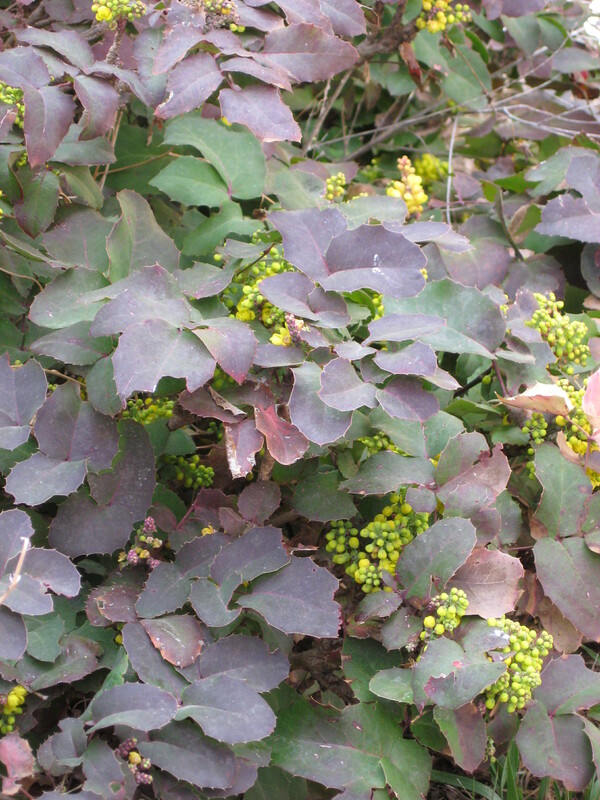 The oregon grape has been blooming a little bit for a while now, but this week it really started to bloom abundantly! The bees are enjoying the flowers. We have a lot of dandelions around and the bees are delighted to visit and pollinate those flowers! Please do not spray any chemicals in your landscapes, and especially not where flowers are blooming. These chemicals, whether they are pesticides, herbicides, or chemical fertilizers, are poisonous to wild critters and pets, not to mention people, and including our important pollinators. Your gardens can thrive without them, and you can use organic growing methods instead and get wonderful results! I also wanted to give you a significant update about Hannah and Gretel (formally called Hansel and Gretel). We have learned the ducks are two hens rather than a mated pair, hence the name change. 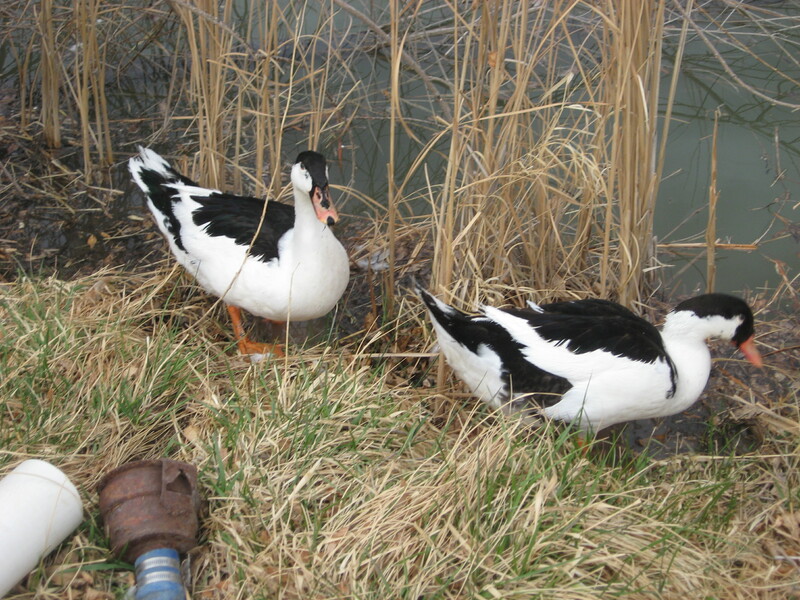 They are enjoying life here on the farm and are foraging bugs, worms and newly sprouting green grass near the pond. Today, Chris and I made them a house for night-time use. If you visit during our Open Farm Days, you’ll be able to visit with Hannah and Gretel if you like, but remember, please do not feed them while you are here. Part of their job on the farm is to do bug patrol work and the more bugs they eat, the better our gardens and crops will be. Do enjoy your visit with them, but leave them to do their work when you are here. That’s all for now. 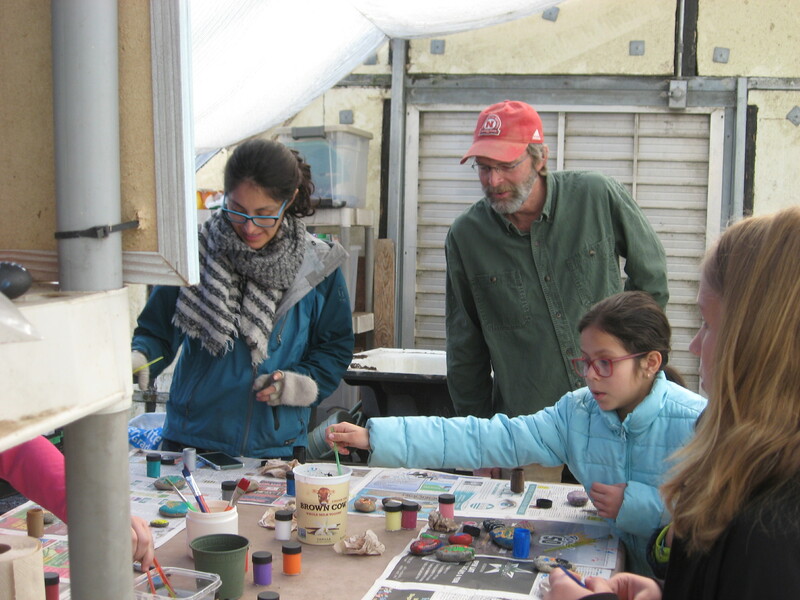 We are hard at work getting the Farm Stand store stocked with great plants, getting gardens tended, and making sure we have things ready for the free workshops on the weekends during Open Farm Days. One task is finished and that is the painted rocks are ready to be found when you visit.